Horley Town end October on a high with a midweek 7-2 win against Guildford City, ending City’s eight match unbeaten run, followed by a two-goal victory and clean sheet at Abbey Rangers on Saturday. It was summer signings Tate Greenaway and Kyle Hough who found the target; the first goal on twenty minutes and the second, on ninety-five. Deserved winners of the game, Abbey Rangers confessed that they “Didn’t deserve anything” from the encounter. A strong start, strong finish but poor middle is becoming a reoccurring theme for the Oakmen, as they suffered another defeat. Some positive runs down the wing and great interchanges between players, were not enough for Uckfield to take anything from the game. After dominating the opening, Town found themselves a goal down at half time, which was doubled only two minutes after the interval. The unavailability of players through injury and suspension, is proving detrimental to the team, and they are falling short across all key positions. Graham Sullivan comments: “There are enough positive performances to keep the faith and we are hoping to get the season back on track next week at Wick”. The Hillian’s returned to winning ways with an emphatic five-goal win over Beaconsfield in the Buildbase FA Trophy. Burgess Hill took the lead after only five minutes, through Chris Smith, following a long corner from Crawley loanee, Dean Cox, and a heavy deflection of his half-volley. The second goal of the game came three minutes later, when Callum Bunting headed Beaconsfield back into the game. Just short of half time, Dean Cox volleyed home a wonder strike, putting the Hillian’s ahead on thirty-seven, and then moments before the whistle, on forty-five, Sam Fisk made it three. Following the interval, Jonah Ayunga extended Town’s lead on fifty-six after being played in by Dean Cox and lifting the ball over the defence. After bagging one goal and three assists, Dean Cox put the icing on the cake in the ninetieth minute, when he scored his second and made it five for the Hillian’s. Earlier this season Dorking FC suffered a five-goal defeat to AC London at Westhumble, in which playing tirelessly until the final whistle and using all three substitutes was not enough for a consolation. A tough fixture, too early in the campaign for the youthful and inexperienced side was our verdict. However, fast forward ten weeks to the return fixture, and the Chicks really do impress with how far their young squad has come in such a short space of time. The Chicks overcame deficits twice in the game and battled to the final whistle. After conceding after six minutes through a goal keeping error, Dorking responded quickly with four successive corners and some excellent build up play. With momentum building, the Chicks found their equaliser through Paul Davis who struck an outstanding twenty-eight yard volley, and the game reached half time level. After the interval, Dorking found themselves chasing the game early on for the second time. AC London took the lead five minutes into the restart and extended their lead to 3-1 seventeen minutes later. A superb free kick taken by Kieran Lunn brought Dorking back into the game, when the ball rattled the underside of the crossbar and went over the line with five minutes to go. Time did run out for the Chicks to make the ultimate comeback, however, many there were many positives to draw from the performance. It was an impressive warm up for next Saturday’s FA Cup tie with Oxford United, as Merstham thrashed Waltham Abbey 5-0 in the FA Trophy. The Moatsiders made a couple of changes with Josh Smith starting in goal. It wasn’t long before they were in the lead, with Kristian Campbell opening the scoring after just two minutes, and Omal Folkot doubling Merstham’s lead in the fourth. The Moatsiders continued to dominate possession and all but ended the contest before half time, with Campbell and Folkot grabbing their second of the game in the twenty-eighth and forty-second minutes. Dan Bennett made it five on the sixty-eight minute mark, and it was more than enough to see Merstham through to the next round. All eyes will now be on the historic FA Cup first round game with Oxford next Saturday. Horsham went down at home to Romford in the first round of the FA Trophy, with a poor first half display to blame. Horsham were two goals down at the break, with both goals coming from Romford striker Mckenzie in the thirteenth and twenty-third minutes. A lethargic display saw Horsham struggle to get into the game, and they left themselves a mountain to climb in the second half. The game was all but over when Mckenzie struck his hat-trick on fifty-three minutes. They did manage to hit the back of the net, but Sackman’s effort on sixty minutes would be nothing but a consolation. It’s back to league business next week as Horsham host Faversham. Oakwood took all three points as they visited second from bottom St. Francis FC in their Southern Combined Counties match. Keiron Purkis scored the only goal of the game in the sixty-third minute. Oakwood are now thirteenth in the division with two wins and one draw from their last five matches. Manager, Jimmy Ferrar comments: “I think our possession and second half performance was superior overall, although the performance overall was not up to recent levels. Playing 120 minutes on Tuesday night took its toll, and they had a couple of chances late on, with one being cleared off the line. Recently our performances have been getting better and better. We’ve bought in some youngsters, and there is a renewed energy about us. Our recent results have not reflected our performances. We can kick on from Saturday and I want to see us back up at the right end of the table”. A late penalty from Jamie Collins earned 10 man Sutton United their second consecutive 2-2 draw, and denied York City’s hopes of ending their run of nine games without a win. Sutton took the lead after seventeen minutes when Craig Eastman was brought down in the area by Simon Heslop, and Collins scored the resulting spot kick. The lead only lasted six minutes however, when the U’s defence failed to clear a York throw-in and Daniel Nti lobbed a great shot over the on-rushing Ross Worner, who perhaps should have stayed on his line. The hosts took the lead in the second half when Danny Galbraith dipped a shot from twenty-five yards over Worner. U’s hopes of an equaliser looked to be dealt a significant blow, when Dean Beckwith was given his marching orders in the seventy sixth minute, picking up a second yellow card for an off the ball collision. It wasn’t over though, as James Collins was on hand again to keep his cool from the penalty spot and salvage a point in injury time. Sutton are in a good run of form, unbeaten in their last four games. Their next fixture sees the U’s travel to Dartford in the first round of the FA Cup. An excellent display from the Anvils was undone by a harsh late penalty. The visitors defended valiantly against a side that is flying high in 4th in the Southern Combination Premier, and deserved at least a point for their efforts. Deep into injury time, Heath fired in a cross which hit an outstretched Anvils’ arm, and Callum Saunders converted the winner. After a 4-0 midweek win, Lingfield travelled to Midhurst & Eastbourne in the Southern Combination Division One with a lot of confidence. The visitors had a host of early chances, but a mixture of weak shots and scuffed efforts saw the home side grab the lead against the run of play. The game continued in the same vein with a few Lingers shots going wide before the home side nodded in a header to make it 2-0 just before the break. Second half substitute Nathan Hull got a late goal for Lingfield in what turned out to be a frustrating game, which saw the side make the trip home empty handed. Redhill FC made the short trip to Reigate to play against South Park Reserves. The Reserves started clinically grabbing two goals in the space of three minutes but it didn’t stay that way for long. Unbelievably two goals from Sam Marks in the space of a minute and a Chris Ransome header saw the Lobsters take the lead after only nine minutes played. Ransome added another before half time to make it 4-2 to the away side at the break. The second half saw South Park Reserves get back into the game and score two goals, to draw it level with Redhill, with their first draw of the season. South Park travelled to Faversham Town in the FA Trophy. The game started poorly for South Park with a quick counter attack leading to a goal in the first minute for the hosts. The home side continued to create chances and got their reward in the twenty-second minute to make it 2-0. But South Park were quick to respond with an in-swinging corner going in off Joe Jackson at the near post, somewhat against the run of play. The visitors were level before half time when Jackson latched on to a cross to get his, and South Park’s, second of the game. Jackson completed his hat-trick on sixty-nine minutes when he headed in from another cross to see South Park take the lead for the first time. Ten minutes later the lead was increased by two as Kieran Lavery found the top corner from a free-kick. The game ended nervously as a ninetieth minute goal for the home side gave them hope, but there wasn’t enough time, and South Park progress in the FA Trophy and make it six wins in October. Dorking Wanderers missed an opportunity to go top of the Ryman League South after letting a two goal lead slip at Westhumble. James McShane put the hosts ahead after twenty-five minutes, and the lead was doubled shortly after the break by Rob Sheridan. Alex Penfold’s free kick with twenty minutes remaining gave the visitors a way back into the match, and Andrew Mensah brought the sides level nine minutes later. Wanderers failed to regain their lead, and will perhaps see this result as two points dropped. Wanderers are second in the Ryman League South on goal difference, and face an exciting clash on Tuesday night at third placed Hythe Town. Defeat in last week’s eight goal thriller at Jubilee Field sees Three Bridges slip to the bottom of the Ryman South Table. Kieran Djilali levelled for the hosts immediately in the second half after his side had gone in at the break 1-0 down. Bridges then took the lead through Hakeem Adelakun, as they sought after a much needed three points. The lead only lasted six minutes, however, when substitute Stephen Okoh equalised for the visitors just three minutes after coming on. Bridges began to lose their control on the game, and goals from Ronnie Conlon and Jamie Brotherton put the away side two goals ahead. Tony Garrod snatched one back to make it 4-3, but it wasn’t enough for Three Bridges to get anything out of the game, and Jack Dixon completed the scoring late on. It’s been an October to forget for Three Bridges, losing all eight of their games in all competitions. They’ll be hoping November will bring better fortunes, as they travel to Hastings United on Tuesday. Chipstead secured a vital three points with a well-earned 1-0 win at Ramsgate. Chips started strongly as they searched for an opener, Tommy Smith coming closest heading just wide from Scott Simpson’s corner. Chips got the goal they deserved on thirty-one minutes, skipper Jordan Martin heading in Danny Penfold’s corner virtually unchallenged. The hosts had chances to equalise, but a resolute Luke Colquhoun ensured he kept the side’s clean sheet between the sticks. It was a fully deserved three points for Chipstead, and manager Anthony Williams will be hoping for more of the same when they fly to Guernsey on Tuesday. The next home fixture for Chips the visit of Walton Casuals on the 5th November, which has free entry for all. Crawley Town are now without a win in four after defeat to second placed Carlisle, who are unbeaten in fifteen games. 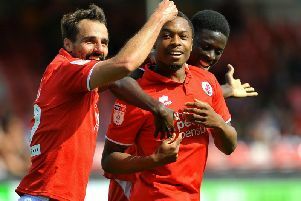 It was a tough afternoon for the Reds after a long journey up to Brunt Park, and found themselves behind after just five minutes when Jabo Ibehre towered over the Crawley defence to head in Tom Miller’s long throw in. The lead was doubled in the twenty-eighth minute when Jason Kennedy reacted quickest to jab past Crawley keeper Glenn Morris. The Reds were 3-0 down on the stroke of half time, Luke Joyce finding himself in acres of space and firing in a 30-yard screamer into the top corner. Crawley had a better second half as they looked for an unlikely comeback, but could only muster an injury time consolation, with Mark Connolly’s second of the season.